rofessional sound mixers, along with the right audio mixing and storage technologies, are key factors in delivering real time digital audio content. Skilled sound mixing engineers are in high demand and Ken “Pooch” Van Druten has the résumé credentials to prove it. “Pooch” (as his friends like to call him) has applied his expert skills as FOH Mixer, Monitor Mixer, Tour Manager, and Production Manger for such diverse artists and bands as Eminem, Guns & Roses, Mötley Crüe, Ozzy Osbourne, Limp Bizkit, Seal, and Whitney Houston. 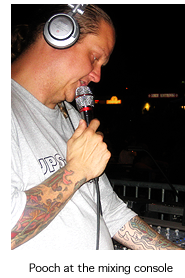 Pooch is an accomplished FOH engineer whose job is to operate sound equipment and consoles to control, replay, and mix sound from various sources in live concerts and the production of audio in music and film. The life of a sound mixer is intense, yet extremely rewarding as Pooch finds himself on the road traveling from venue to venue. 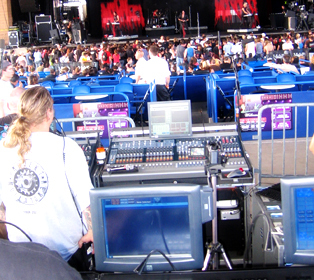 As Linkin Park’s FOH Mixer, Pooch is on tour with the two-time GRAMMY®-winning band for the fourth incarnation of their popular Projekt Revolution concerts. The national tour began July 25, 2007 in Auburn, Washington and ends September 3, 2007 in Englewood, Colorado. A few days ago Pooch, his crew, and their audio mixing equipment,(1) including three Fusion™ four-drive desktop storage systems, were in the cities of Devore, Mountain View, and Chula Visa, California. The schedule is fast and hectic. Today Pooch and his group of audio experts set up their consoles and equipment at their latest location, Cricket Pavilion in Phoenix, Arizona. 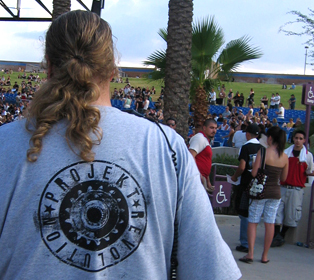 It’s a hot August summer day, but that doesn’t stop the crowd of rockers and emo-laced girls and guys, with prominent eyeliner and tight fitting dark clothes, from enjoying the music as the band tears up the stage with the raw and powerful sound of nu-metal—an infusion of rap, rock, metal, and alternative. Behind the scenes, Pooch is busily overseeing the mixing of the band’s live performance. Live recordings outside the confines of the recording studio always present a challenge—greater attention to detail is important for any project that requires the capture of live acoustics. At his disposal is an array of consoles, mixing boards, Apple® Power Mac® G5 and Mac® Pro systems, and a Sonnet Fusion storage system. Pooch and his team chose Sonnet storage for its reliability, ease of data movement between machines, and stability. “They are the best external storage systems we have used,” says Pooch. Featuring a quad interface with eSATA, FireWire® 800, FireWire 400, and USB 2.0 connections, the Fusion storage systemoffers a flexible and versatile interface to connect to almost any computer. 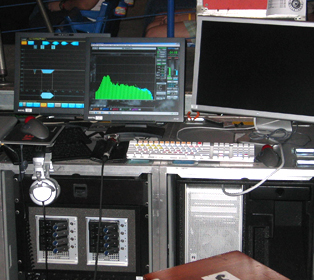 In the field Pooch utilizes Fusion systems connected via FireWire 800 interface to store and retrieve audio files, which are mixed and edited with Digidesign Pro Tools audio editing software, and then delivered as AIFF sound files as a final product. As Pooch states, “We record a live show and then travel with the drives to an editing machine, and then to a mixing machine. We have to deliver product within 72 hours, so speed is key.” For even greater performance, the eSATA port on the Fusion system can be utilized with a host adapter card, such as a Sonnet Tempo host computer card. As the concert draws to a close, the audience cheers while Linkin Park concludes the evening with an encore, performing their hit song “One Step Closer”. Pooch is at his mixing console behind the crowd. Their arms are in the air waving. A grin spreads across his face as he feels the energy of the band and the audience…Pooch embraces his art of mixing revolutionary sound, and the Sonnet Fusion storage system brings him, as the band performs, one step closer to the completion of another successful recording project. To learn more about Linkin Park, visit www.linkinpark.com. For more info on Ken “Pooch” Van Druten, visit his production management company, Evil Entertainment, at www.evilentertainment.net. (1) Audio Mixing Configuration: The complete mixing hardware setup consists of two Power Mac G5s and one Mac Pro configured with three Digidesign™ HD PCI cards in each system. All mixing systems include: two 23" Apple Cinema Displays®, one Digidesign Command|8 control surface, one Digidesign 96i I/O interface, Genelec 8050 speakers, and three Sonnet Fusion desktop SATA storage system. We really wanted to go with SATA drives because they are easy to hot swap. We got various recommendations for Sonnet and how well the product is from other people in the industry, especially video editors.